I didn’t see Saturday 21st coming. It was just a day after we had successfully held another session of Fatuma’s Voice at Pawa 254 amid angry clouds and a wet Nairobi. Still trying to fathom how patient our audience managed to be despite the rain. We enjoyed the poetry till the end and no one really complained. My Saturdays are usually laid back. I rarely even buy bundles to browse the internet because I am normally switched off from the madness of sitting on my laptop all week just planning for Friday, and of course doing many other things like answering emails and writing new ideas that would make Kenyan Poets Lounge a better place for art lovers. I am subscribed to the tweets of a number of accounts that I follow, most probably because they keep me abreast with what’s happening where, almost instantly. I received a few tweets that pointed out that there was a scuffle at Westgate Shopping Mall in Westlands, Nairobi, and gunshots had been heard. I took it lightly first time before they begun coming in persistently. Sensing danger, I checked the TV for any breaking news. There was nothing yet. I had to get online to affirm my concerns. It didn’t take long before discovering that something was really wrong. Like a lightning flash, the social media sites became awash with terror messages, fear, and anxiety. 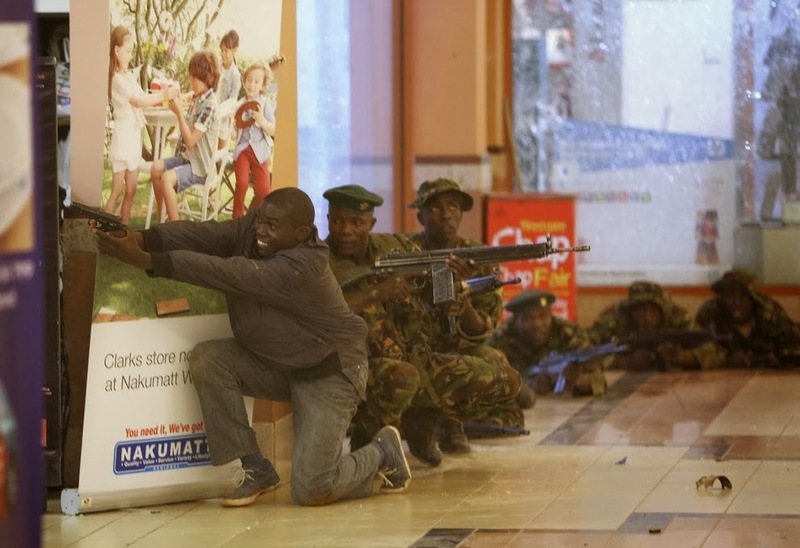 And then the breaking news came of gunmen having opened fire at innocent civilians in the mall. An hour into the ordeal, I begun texting my friends and family confirming if they were safe and whether they knew anyone who was inside. Things were getting tensed up when I began following tweets from people who were at the center of the mayhem. Then it occurred to me that I had a friend trapped in there. Then the disturbing pictures began trickling in on TV. Horror! We were advised not to call anyone who was inside. Someone had been shot out of their phone ringing. More anxiety. I was fighting to be calm but it was proving to be a very hard fight. Imagining the position of the hostages was just mind boggling. I kept asking myself what I would have done had I been in their shoes. Somebody said, after being rescued, that you wouldn’t wish that experience even for your worst enemy. Now that’s an ugly picture. Sunday morning came. I was scheduled to have a radio interview at Daystar University’s SHINE FM 103.1 that evening. My mind was unsettled. My friend was out the previous day evening. But there was news that came in. News that tore my heart apart, that Ghanaian poet, Professor Kofi Awoonor was among the victims killed. No, that wasn’t just a statistic. That was anger shot down my spine!! He had come to attend the Storymoja Hay Festival. That is my pain right there!